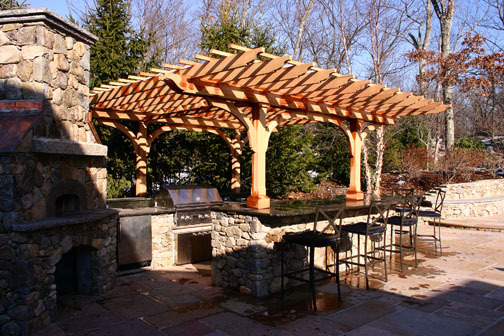 An exquisite patio area with an outdoor kitchen is accented with an overhead pergola. 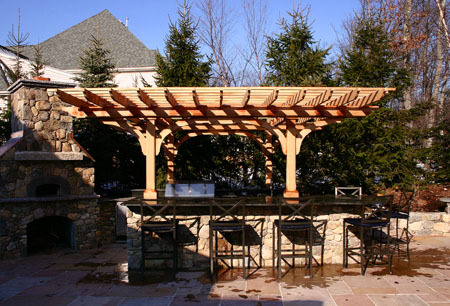 This structure will be covered with climbing vines to create an elegant shaded seating area. The beams and rafters were extended several feet beyond the main posts to cover the counter and chairs thus creating a beautiful cantilevered top. The stone counter top was cut to receive the posts. The plinth bases slid down over the posts and were secured. 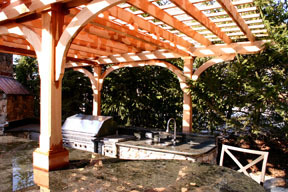 The final result: a stunning and welcoming outdoor kitchen.